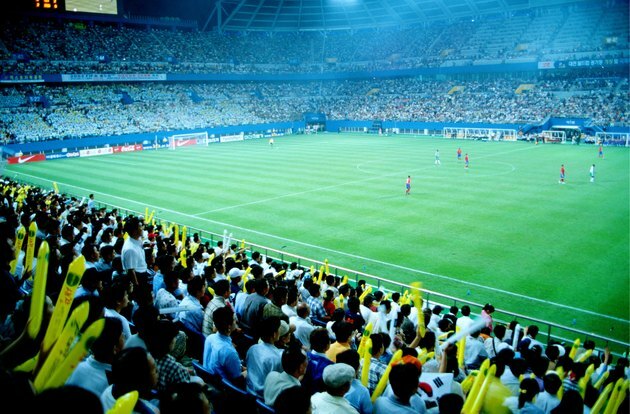 Every four years, soccer fans across the globe shift their attention to the FIFA World Cup. This tournament, which began in 1930, is a celebration of the "beautiful game" and includes 32 teams playing in a variety of stadiums in a chosen host region. FIFA provides rough parameters for its field sizes, but World Cup fields are typically the same size. FIFA stipulates that fields in regulation matches must adhere to a specific set of criteria. The touch line, which makes up the long measurement on each side of the pitch, must measure a minimum of 100 yards and a maximum of 130 yards. The goal line, which runs behind the goal at each end of the pitch, must measure between 50 yards and 100 yards. The width of each line must be the same and may not exceed 5 inches. Despite the significant range in FIFA-approved field dimensions, World Cup pitches are typically close in size, if not identical. First National Bank Stadium in Johannesburg, used during the 2010 World Cup, had a pitch size of about 115 yards by 74 yards. Olympiastadion Berlin, used in the 2006 World Cup, had the same pitch size. What Is the Official Ping Pong Table Size?